jojoebi designs: We are having babies! Ebi-kun and his friends went to a disused patch of land nearby and caught a load of lizards, so we now have 3 of the little critters! One of them was quite fat so he went off and researched and decided that she must be about ready to lay eggs. 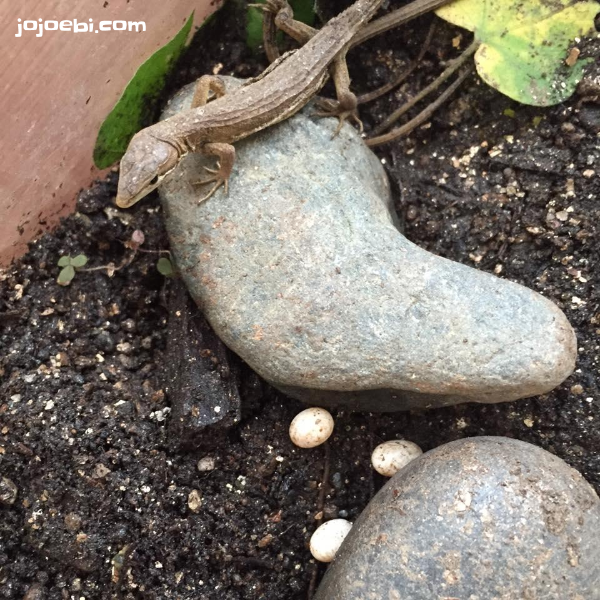 Yep, we now have 3 lizard eggs. The book suggested moving them out of the tank, so they are now sat in a bowl, Ebi-kun will have to sort out a new tank when he gets home from school. I'm not sure how long they take to hatch, Ebi-kun is super excited. I'm also not sure what we are going to do with them over the holidays, I can't see daddy being up for foraging in the undergrowth for grasshoppers and the such like! I think they will have to be released into the garden when it comes time for us to get on the plane!